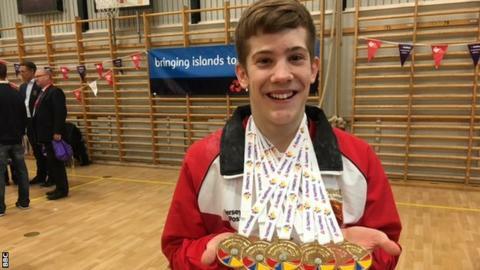 Jersey gymnast Daniel Lee claimed five individual gold medals on the final day to ensure they finished above Guernsey in the Island Games medal table. The 18-year-old, who was brought up and trains in the United Kingdom, also won a bronze as he dominated most events. Stuart Parker was also a multiple champion on day six, taking the tennis singles and doubles titles for Jersey. Guernsey tasted half-marathon success, with Lee Merrien winning men's gold and Louise Perrio taking the women's race. The Sarnians also thought they had won top honours in the 4x400m relay, but they were disqualified as team manager Tom Druce was adjudged to have pushed an opponent. That handed victory to Jersey, who had finished more than three seconds behind their Channel Island rivals. Lee, meanwhile, triumphed in the floor, high bar, parallel bars, rings and pommel horse events, while also winning bronze in the vault. "It's amazing, it's more than I could've hoped for. I knew if I came here and did all my routines cleanly then I'd have a shot at getting a few medals, but this has blown me away." In the men's tennis, Parker swept past Guernsey's Pat Ogier 6-0 6-2 in the singles final, before teaming up with Michael Watkins to beat Bermuda 6-3 6-0 in the doubles. "Stuart's the best player that's ever been at the Games I think," said Ogier after his defeat. "At times like that you've just got to applaud." Guernsey also claimed a tennis gold, Rob West and Jo Dyer thrashing hosts Gotland 6-1 6-0 in the mixed doubles final. On a day of racquet sport finals, the badminton mixed doubles pitted Elena Johnson and Ove Toennes Svejstrup against fellow Sarnians Jordan Trebert and Chloe Le Tissier. Johnson and Svejstrup triumphed 21-9 21-19 over their compatriots to take a gold medal which was always going to go to the greens. Trebert was also piped to the post in the men's singles final, as he was beaten 21-14 21-6 by Jersey's Mark Constable on his way to a silver medal. After disappointment for both Jersey's women and Guernsey's men in the football semi-finals on Thursday, both came good to win their third-place play-offs and come away with bronze. Jersey beat the Isle of Wight 3-1, while Guernsey triumphed 1-0 against Menorca thanks to Matt Loaring's goal. "It's probably my proudest moment as a footballer. After only getting this young, raw squad together six weeks ago, what we've achieved is beyond words," said record Guernsey FC scorer Ross Allen. The golf competitions, consisting of four 18-hole rounds, reached an end, with Jersey teenager Flora Keites winning silver with a combined score of 326. Her efforts, along with those of team-mates Juanita Adlington, Helen Lagadu, and Hannah Scriven, were also enough to win a women's team bronze. As competition at the Island Games came to an end before 18:00 BST, attention turned to the closing ceremony in Visby. Athletes paraded into the arena, and the official Games flag was passed on to Gibraltar, who will host the multi-sport event next, in 2019. The hosts finished fifth in the final medal table with 23 golds, just behind Jersey and Guernsey, while the Isle of Man led the way with 101 medals - 14 more than any other island. Before the final day Guernsey led their Channel Island rivals on gold medals, though they are still yet to finish above Jersey in the table since 2011.